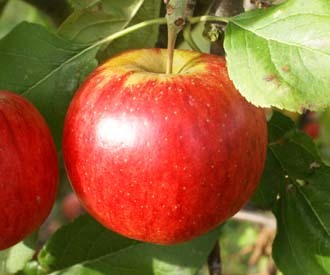 Apple trees are the most popular and widely grown garden fruit trees in the UK. There are good reasons for this popularity. 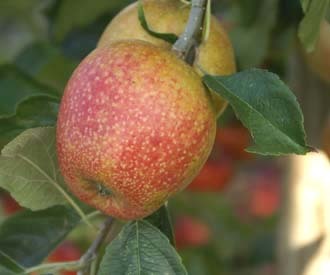 The climate in most of the UK is very suited to growing apples and in particular getting the best flavours from them. 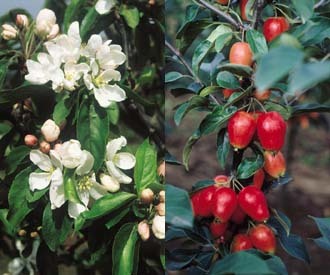 It is a versatile fruit with many possible uses from eating fresh to cooking and making juice or cider. It has a long season and many varieties store well. There is an enormous range of varieties to suit all tastes. 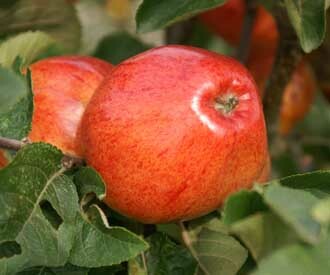 Here at Keepers Nursery we offer the widest range of apple trees for sale anywhere. 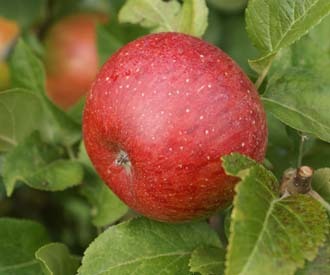 We have over 600 varieties of apple in our collection. Of these we have over 300 available for sale in any one year and we can produce any of the others to order. We have listed a relatively small range of the most popular and our recommended varieties. You can see the full range by clicking on the relevant links below. 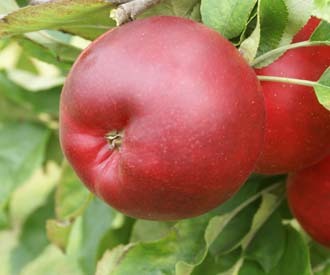 Click here for a guide to choosing apple trees. 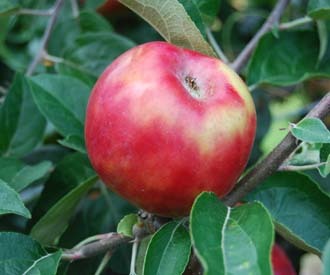 The season for early eating apples runs from early August to mid September. 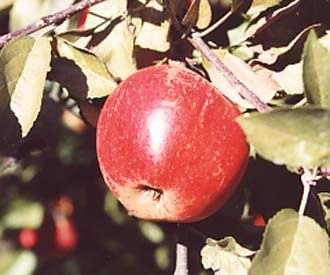 Early varieties tend not to keep well and are best eaten straight from the tree. Please find below 9 of the most popular and recommended varieties. We can offer a total of 94 varieties - click here. 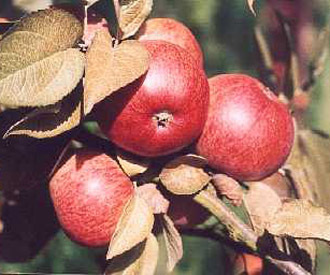 A popular disease resistant early dessert apple. 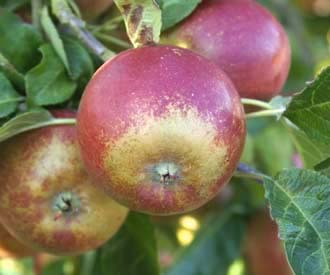 An old dual purpose apple with a distinctive savoury flavour popular in Scandanavia and Northern Europe. 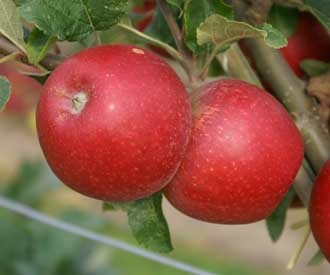 A good heavy cropping early season dual purpose apple from Scotland. A very good summer dessert apple. Sweet and juicy with some Cox flavour. 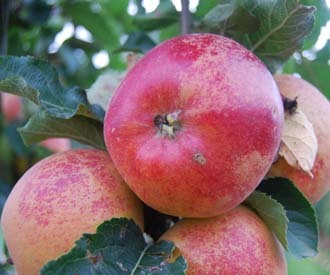 A very tasty sweet red apple with small russet patches giving it a frecked appearance. 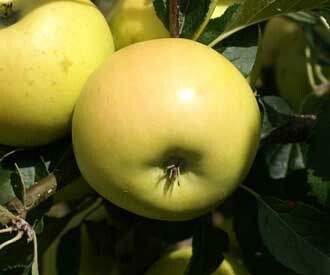 A striking golden yellow apple with crisp juicy flesh and a rich sweet flavour. 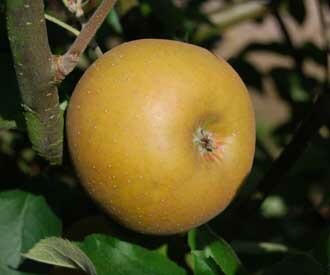 An excellent disease resistant early dessert apple with a fragrant honeyed flavour. One of the best early apples with a very long season. 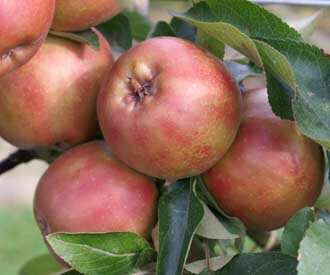 A very popular sweet early dessert apple particularly suitable for growing in colder regions. 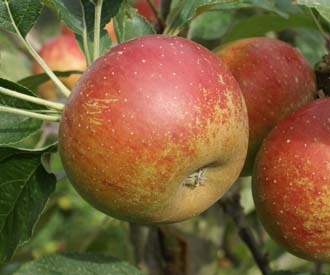 The season eating apples are varieties which ripen from mid September until mid October. These will keep for a limited time, usually not beyond late November. Please find below 8 of the most popular and recommended varieties. We can offer a total of 133 varieties - click here. The best know and most popular of the russet apples. Very distinctive rich nutty flavour. Intensely aromatic Cox like apple with an aniseed flavour. A good alternative to Cox for northern Britain. 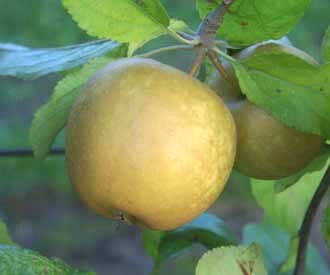 A popular garden variety which produces regular heavy crops of sweet golden yellow fruit. 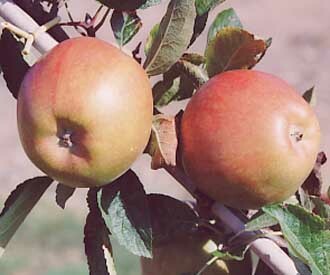 An excellent Cox type apple. Larger and redder in colour than Cox. 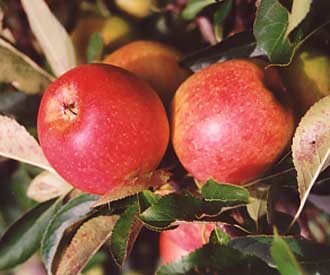 A popular traditional English mid season apple. Good flavour and disease resistance. 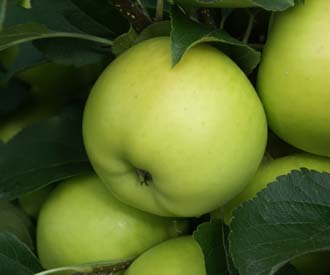 An aromatic Cox like apple. Sweeter and more diseases resistant than Cox. 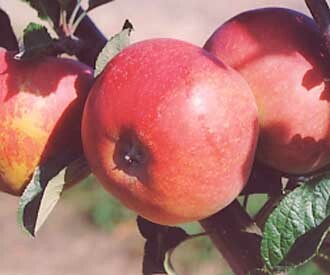 A delicious and attractive modern disease resistant apple with sweet melting flesh. An excellent garden substitute for Cox particularly for regions where Cox can not be grown successfully. 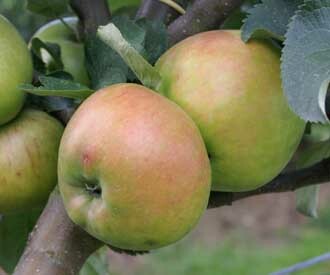 Late season apples are ones which ripen from mid October onwards. These are usually the best keepers and some can be stored right through the winter. Some even need to be stored for a while before being eaten for best flavour. The slow prolonged ripening process late varieties undergo gives them some of the finest and most complex flavours. Please find below 20 of the most popular and recommended varieties. We can offer a total of 278 varieties - click here. 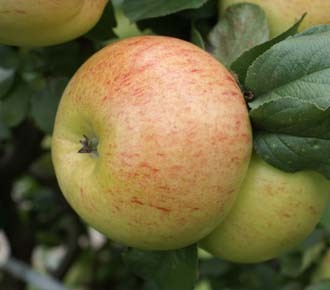 A handsome apple with an unusual conical shape and a dry nutty flavour. A classic old English variety with an intense sweet-sharp, good keeping quality and very attractive blossom. 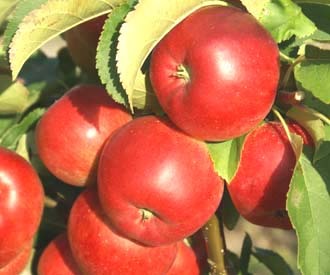 One of the most popular commercially grown apples. Only suitable for the warmer parts of the UK. A very good late russet apple with a strong sweet sharp flavour. 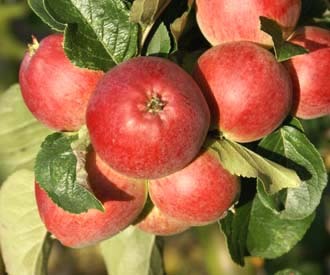 One of the best modern apples with an excellent fruity flavour and good keeping quality. 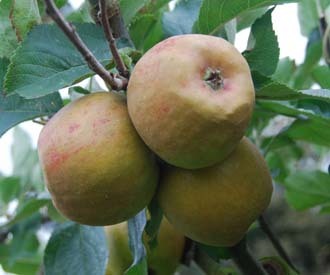 A crisp, juicy, sweet apple with some Cox flavour which crops well and keeps extremely well. 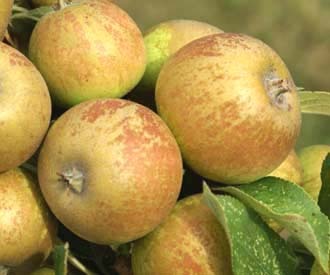 An excellent new variety combining the aromatic flavour of a Cox with a golden russet skin. 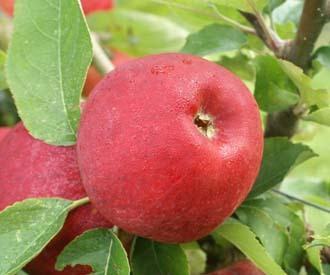 An excellent dessert apple similar to Cox but redder in colour and sweeter in taste. 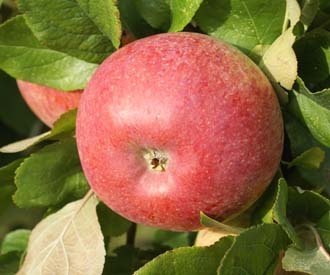 A sweet dessert apple with some of the aromatic flavour of Cox. 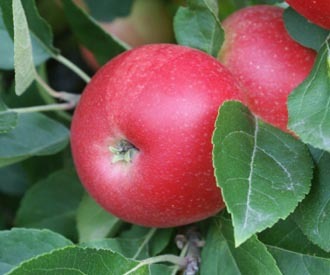 A new disease resistant apple with an attactive pink blush. Firm and crisp with a tangy sharp flavour. An excellent very late eating apple. Crisp with a sharp flavour. An attactive disease resistant modern variety with an excellent sweet flavour and good keeping qualities. One of the most popular modern garden varieties. 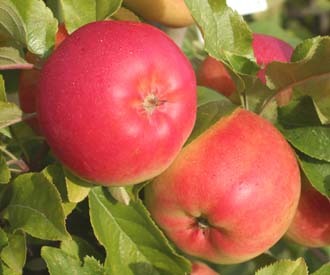 Easy to grow, heavy cropping, crisp and juicy fruit. 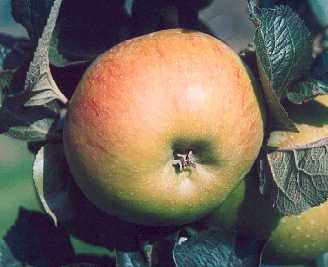 A self-fertile sport of Cox's Orange Pippin. 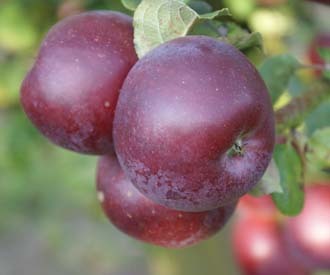 A popular dark red dessert apple. Heavy cropper and easy to grow. A handsome late dessert apple, rich, sweet, with plenty of pineapple-like acidity and very aromatic. 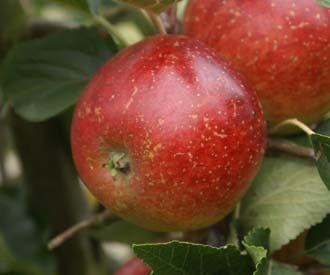 A new classic cox type apple selected by the RHS to celebrate their Bicentennial. 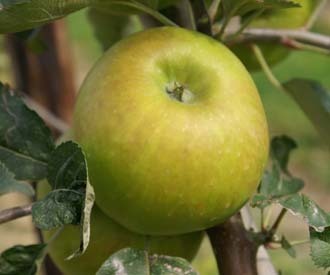 An excellent new disease resistant late dessert apple. Firm and juicy with a refreshing sharp flavour. 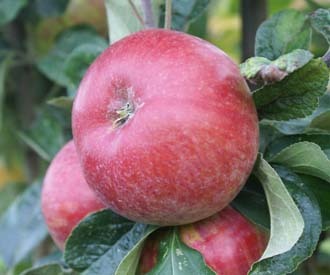 A good late dessert variety similar to Cox in flavour but sharper and later ripening. 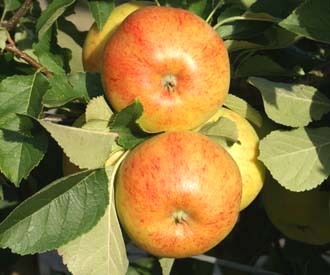 An attractive sweet late ripening apple with good keeping qualities and disease resistance. All apples can be used for cooking. But some varieties are specifically selected for cooking. 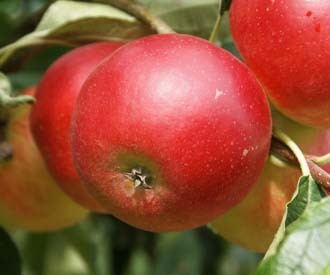 Some are quite acid and cook into a fluff while sweeter cooking apples tend to keep their shape when cooked. Please find below 12 of the most popular and recommended varieties. We can offer a total of 224 varieties - click here. Regarded as one of the best stewing and baking apples. Attractive maroon blossom. 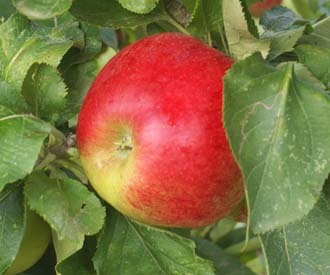 A good heavy cropping mild flavoured cooking apple. 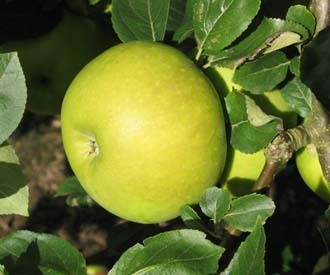 A compact version of Bramley's Seedling with a 20% reduced vigour. 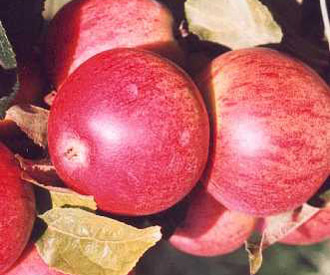 The most popular classic English cooking apple. 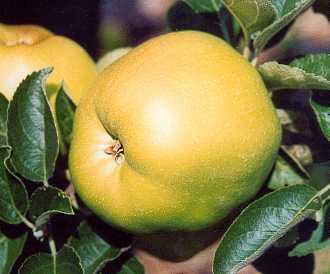 The largest of the English cooking apples capable of producing exhibition fruit of enormous size. A new dual purpose apple particularly good for baking. 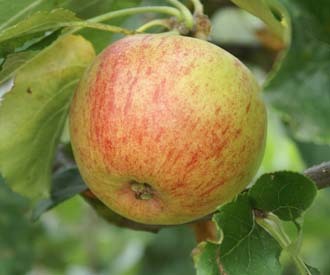 An large Dutch cooking apple with an aromatic Cox type flavour. Excellent for cakes and drying. 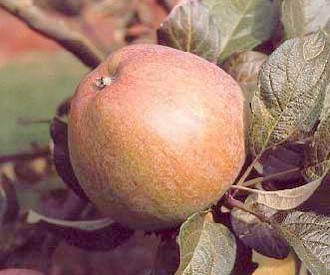 A good disease resistant cooking apple suitable for northern Britain. 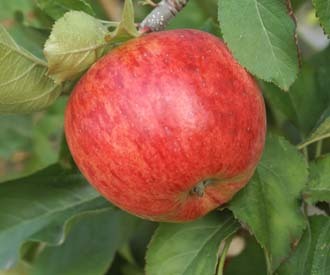 A handsome Victorian cooking apple excellent for baked apple. 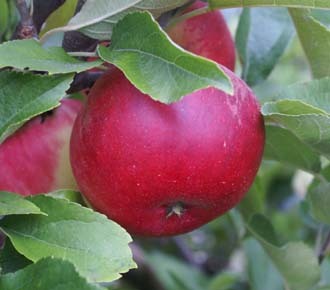 A good early season cooking apple with a compact tree very suitable for small gardens, cordons and espaliers. Cider can be made from any apple juice and is often made from a mixture of juices of different kinds of apple. 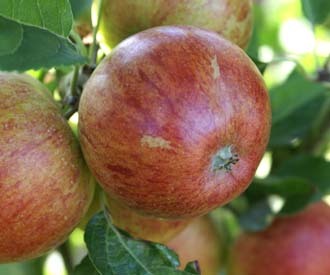 Cider apples have a high tannin content which improves the quality of the cider but gives them a bitter taste which means that they cannot be used for other purposes. Please find below 9 of the most popular and recommended varieties. We can offer a total of 22 varieties - click here. 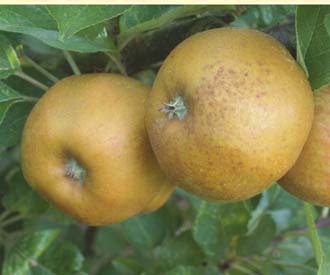 An old full bittersweet Somerset cider apple. 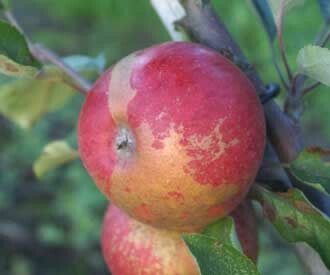 An bittersweet old Somerset cider apple. 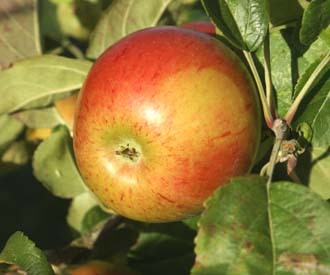 A traditional medium bittersweet cider apple widely grown in the West Country. 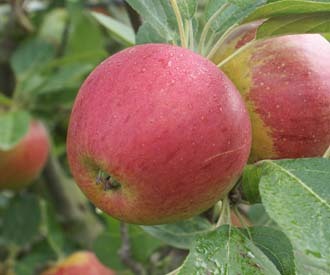 The most popular of the cider apples. A small russet cider apple producing a full bittersweet cider. 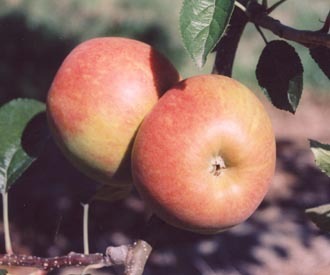 A popular medium bittersweet cider apple from France. 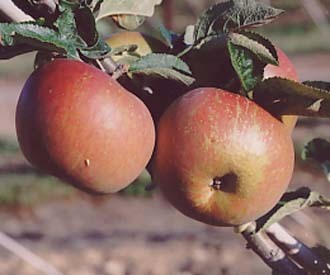 A popular old cider apple. 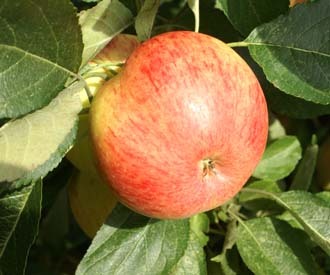 A traditional Somerset cider apple producing a medium bittersweet cider. 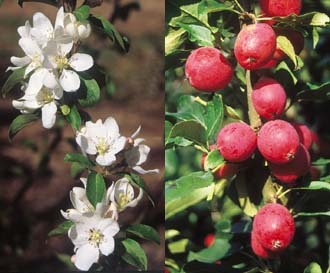 Self-fertile and partially self-fertile apple varieties do not require cross pollination from another apple variety to fertilise their flowers and produce fruit. They can be grown on their own. They may however benefit from cross pollination. Please find below 13 of the most popular and recommended varieties. We can offer a total of 70 varieties - click here. Crab apples trees produce abundant blossom over a long period. As a result they are often planted for their ornamental value or as pollinators. The fruit is small and usually very sharp. Crab apples produce excellent jelly because of their acidity and high pectin content. Please find below 5 of the most popular and recommended varieties. We can offer a total of 20 varieties - click here. An early ripening bright crimson crab apple with red flesh which makes excellent a red jelly. 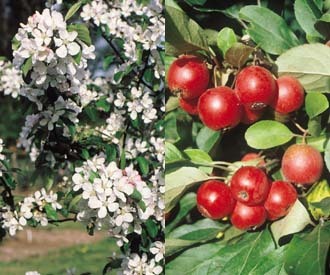 One of the most popular crab apple for jelly making. It produces an orange coloured jelly. 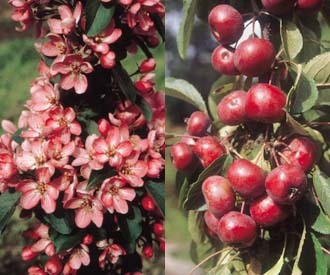 A dwarf columnar tree with red leaves, deep pink blossom and red fleshed crab apples. Red leaves and deep pink blossom in the spring. 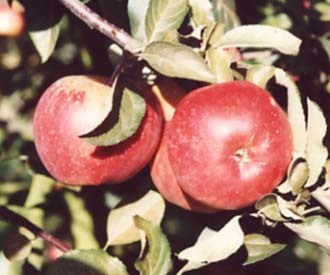 Large small apple-sized pink fleshed crab apples.